Islamic eschatology is the branch of Islamic scholarship that studies Yawm al-Qiyāmah (pronounced yome-ul-key-ah-mah; Arabic: يوم القيامة‎ "the Day of Resurrection") or Yawm ad-Dīn (pronounced yome-ud-dean; يوم الدين "the Day of Judgment"). This is believed to be the final assessment of humanity by God (Allah), consisting of the annihilation of all life, resurrection and judgment. The time of the event is not specified, although there are major and minor signs which have been foretold to happen with Qiyamah at the end of time. Many verses of Qur'anic Sura contain the motif of the impending Day of Resurrection. The 75th Sura of the Qur'an, "al-Qiyama", has as its main subject the resurrection. Its tribulation is also described in the hadith, and commentaries of Islamic expositors such as al-Ghazali, Ibn Kathir, Ibn Majah, al-Bukhari, and Ibn Khuzaymah. The Day of Judgment is also known as the Day of Reckoning, the Last Day and al-sā'ah, or the Hour. The hadith describe the end time with more specificity than the Qur'an, describing the events of al-Qiyamah through twelve major signs. At the time of judgment, terrible corruption and chaos will rule. The Mahdi will be sent and with the help of Isa, will battle Masih ad-Dajjal. They will triumph, liberating Islam from cruelty, and this will be followed by a time of serenity with people living true to religious values. However, there is no mention of the advent of Mahdi and Isa in one era in any of the hadith. Some Muslim scholars translate the Arabic word "Imam" as "Mahdi" to prove the advent of Mahdi and Isa in a single era. Like other Abrahamic religions, Islam also teaches resurrection of the dead, a final tribulation and eternal division of the righteous and wicked. Islamic apocalyptic literature describing Armageddon is often known as fitnah, malāḥim (الملاحم, meaning bloody fights, massacres), or ghaybah in Shī‘a Islam. The righteous are rewarded with pleasures of Jannah, while the unrighteous are tortured in Jahannam. The Day of Judgment or Resurrection, al-Qiyāmah, is one of the six articles of faith in Islam. The tribulation associated with it is described in the Qur'an and hadith, and commentaries of Islamic expositors like al-Ghazali, Ibn Kathir, Ibn Majah, al-Bukhari, and Ibn Khuzaymah. The Day of Judgment is also known as the Day of Reckoning, the Hour, and the Last Day. The Day of Judgment or Resurrection, al-Qiyāmah, relates to one of the six aqīdah in Sunni Islam, and seven aqidah in Shī‘a belief. There are two main sources in Islamic scripture that discuss the Last Judgment: the Qur'an, which is viewed in Islam as infallible, and the hadith, or sayings of the prophet. Hadith are viewed with more flexibility due to the late compilation of the traditions in written form, two hundred years after the death of Muhammad. The concept has also been discussed in commentaries of Islamic scholars such as al-Ghazali, Ibn Kathir, and Muhammad al-Bukhari. The time is known only to Allah. Muhammad cannot bring it forward. Those who have been dead will believe that a short time has passed between birth and death. Nothing will remain except Allah. God (Allah) will resurrect all, even if they have turned to stone or iron. Those that have accepted false deities will suffer in the afterlife. There are three periods before the Day of Judgment, also known as ashratu's-sa'ah or alamatu qiyami's-sa'ah, with some debate as to whether the periods could overlap. There are a number of major and minor signs of the end of days in Islam. There is debate over whether they could occur concurrently or must be at different points in time, although Islamic scholars typically divide them into three major periods. Coming of 30 Dajjals, everyone presuming himself that he is an apostle of Allah. Until a person would pass by a grave of another person and he would say: I wish it had been my abode. Loss of honesty, and authority is given to those who do not deserve it. The taking away of knowledge and the prevalence of religious ignorance. Frequent occurrences of sudden and unexpected death. The spread of riba (usury, interest), the spread of zina (adultery, fornication), drinking of alcohol. The widespread and condoning of music. The decoration of mosques as a matter of pride and competition. Women will increase in number and men will decrease in number so much so that fifty women will be looked after by one man. Frequent occurrences of disgrace, distortion, and defamation. When people wish to die because of the severe trials and tribulations that they are suffering. When paying charity becomes a burden. Nomads will compete in the construction of very tall buildings. Women appearing naked despite their being dressed. Seeking knowledge from misguided and astray scholars. The liar is believed, the truthful is called a liar and the honest is called a traitor. The death of righteous knowledgeable people. The emergence of indecency (obscenity), enmity among relatives and neighbours. The rise of idolatry and polytheists, in the community. The Euphrates will uncover a mountain of gold. When the land of the Arabs returns to being a land of rivers and fields. The Romans would form a majority amongst people. Earning of money through unlawful (Haram) ways increases. When there is much rain but little vegetation. Evil people will be expelled from Al-Madinah. Wild animals communicate with humans, and a man speaks to his whip or his shoe, and his thigh will tell him about what happened to his family after he left. There will be a special greeting for the people of distinction. Trade will become so widespread that a woman will help her husband in business. No truly honest man will remain and no one will be trusted. Only the worst people will be left; they will not know any good or forbid any evil (i.e. No one will say there is no God but Allah). Nations will call each other to destroy Islam (Islamic values, culture, teachings, Muslims) by any and every means. Qur'an and Islamic knowledge will be passed on, but no one will follow it correctly. Muslim rulers will come who do not follow the guidance and tradition of the Sunnah. Some of their men will have the hearts of devils in a human body. Stinginess (being miserly) will appear, honourable people will perish and dishonourable people would prevail. A man obeys his wife and disobeys his mother; and treats his friend kindly whilst shunning his father. Voices are raised in the mosques. The leader of a people is the worst of them. People treat a man with respect because they fear some evil he may do. The false messiah, Masih ad-Dajjal, shall appear with huge powers as a one eyed man with the other eye blind and deformed like a grape. He will claim to be God and to hold keys to heaven and hell and lead many astray, although believers will not be deceived. His heaven is the believers' hell, and his hell is the believer's' heaven. The Dajjal would be followed by seventy thousand Jews of Isfahan wearing Persian shawls. The return of Isa, from the second sky to kill Dajjal. Ya'jooj and Ma'jooj (Gog and Magog), two tribes of vicious beings which had been imprisoned by Dhul-Qarnayn will break out. They will ravage the earth, drink all the water of Lake Tiberias, and kill all believers in their way (or see). Isa, Imam Al-Mahdi, and the believers with them will go to the top of a mountain and pray for the destruction of Gog and Magog. Allah will eventually send disease and worms to wipe them out. A huge black smoke cloud will cover the earth. Dabbat al-ard, or the Beast that will come out of the ground to talk to people. The sun will rise from the west. The second trumpet blow will be sounded, the dead will return to life and a fire will start come out of Yemen that shall gather all to Mahshar Al Qiy'amah (The Gathering for Judgment). Muslims shall fight against a nation wearing shoes made of hair and faces like hammered shields, with red complexion and small eyes. The emergence of the Sufyani within the Syria region. The truce and joint Christian-Muslim campaign against a common enemy (at the conclusion of which all war technology shall become unusable) followed by al-Malhama al-Kubra a non-Muslim vs. Muslim war. Black Standard will come from Khorasan, nothing shall turn them back until they are planted in Jerusalem. Mecca will be attacked and the Kaaba will be destroyed. A pleasant breeze will blow from the south that shall cause all believers to die peacefully. Quran will be forgotten and no one will recall its verses. All Islamic knowledge will be lost to the extent where people will not say "La Illaha Ila Allah" (There is no God, but Allah), but instead old people will babble without understanding "Allah, Allah". People will fornicate in the streets 'like donkeys'. 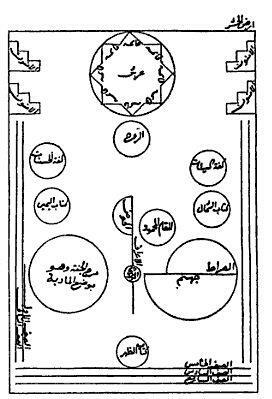 Diagram of "Plain of Assembly"(Ard al-Hashr) on the Day of Judgment, from autograph manuscript of Futuhat al-Makkiyya by Sufi mystic and philosopher Ibn Arabi, ca. 1238. Shown are the 'Arsh (Throne of God (Allah)), pulpits for the righteous (al-Aminun), seven rows of angels, Gabriel (al-Ruh), A'raf (the Barrier), the Hauzu'l-Kausar (Fountain of Abundance), al-Maqam al-Mahmud (the Praiseworthy Station; where the prophet Muhammad will stand to intercede for the faithful), Mizan (the Scale), As-Sirāt (the Bridge), Jahannam (Hell) and Marj al-Jannat (Meadow of Paradise). Though the duration of his rule differs, hadith are consistent in describing that Allah will perfect him in a single night with inspiration and wisdom, and his name will be announced from the sky. He will bring back worship of true Islamic values, and bring the Ark of the Covenant to light. He will conquer Istanbul and Mount Daylam and will eye Jerusalem and the Dome as his home. His banner will be that of the prophet Muhammad: black and unstitched, with a halo. Unopened since the death of Muhammad, the banner will unfurl when the Mahdi appears. He will be helped by angels and others that will prepare the way for him. He will understand the secrets of abjad. Sunni and Shi'ite Islam have different beliefs on the identity of Mahdi. Historically, Sunni Islam has derived religious authority from the caliphate, who was in turn appointed by the companions of Muhammad at his death. The Sunnis view the Mahdi as the successor of Mohammad, the Mahdi is expected to arrive to rule the world and reestablish righteousness. Various Sunnis also share a parallel belief that though there may be no actual Mahdi, the existence of mujaddid will instead lead the Islamic revolution of a renewal in faith and avoidance of deviation from God (Allah)’s path. Such an intellectual and spiritual figure of Sunni tradition has been attributed to numerous Muslims at the end of each Muslim century from the origin of Islam to the present day. This classical interpretation is favored by Sunni scholars like Ghazali and Ibn Taymiyyah. Shi'a Islam, in distinction, followed the bloodline of Muhammad, favouring his cousin and son by marriage, Ali. Ali was appointed the first Imam, and following him there were eleven more. Muhammad al-Mahdi, otherwise known as the twelfth imam, went into hiding in AD 873 at the age of four. His father was al-`Askari, and had been murdered, and so he was hidden from the authorities of the Abbasid Caliphate. He maintained contact with his followers until AD 940, when he was hidden. Twelver Shia Islam believes that al-Mahdi is the current Imam, and will emerge at the end of the current age. Some scholars say that, although unnoticed by others present, the Mahdi of Twelver Shi'a Islam continues to make an annual pilgrimage while he resides outside of Mecca. In distinction, Sunni Islam foresees him as a separate and new person. The present Ayatollahs of Iran see themselves as joint caretakers of the office of the Imam until he returns. Throughout history, there have been multiple claimants to the role of Mahdi that had come into existence through their pious deeds and by subsequently acquiring their own following. One of these men, that of the Bábís and that of the Bahá'ís believed (and believe) that their prophets, Sayyid "Ali Muhammad, the Bab" (d. 1850) and Mirza Husayn "Ali Nuri, Bahá'u'lláh were fulfillers of prophecy. The Bab is thought to be the return of the Twelfth Imam and Bahá'u'lláh the Mahdi. Since the Baha'is now preach a fairly successful international religion with possibly 6 million followers, their concept of a fulfillment of Islamic prophecy is now currently well outside the Islamic world. Abu Hurayrah narrates that the Messenger of Allah said, "By Him in whose hands my soul rests! It is definitely close in that time that Isa, Son of Maryam descends amongst you as a just ruler. He will break the cross, kill the swine and abolish jaziya. And money will abound in such excess that no one will accept it. Hadith reference both the Mahdi and Isa simultaneously and the return of the Mahdi will coincide with the return of Isa. He will descend from the heavens in al-Quds at dawn. The two will meet, and Mahdi will lead the people in fajr prayer. After the prayer, they will open a gate to the west and encounter Masih ad-Dajjal. After the defeat of ad-Dajjal, Isa will lead a peaceful forty-year reign until his death. He will be buried in a tomb beside Muhammad in Medina. Though the two most certainly differ regarding their role and persona in Islamic eschatology, the figures of the Mahdi and Isa are ultimately inseparable for according to the Prophet. Though Isa is said to descend upon the world once again, the Mahdi will already be present. Al-Dajjal or the Antichrist or False Messiah does not appear in the Quran but is a prominent figure in the Hadiths and Islamic eschatology as a whole. He appears gruesome and is blind in his right eye. His one eye is thought to be a symbol that correlates with how single minded he is in achieving his goal of converting Muslims to his side. Al-Dajjal has the intention of gaining followers through his miracle working abilities and apparent wealth and generosity. These abilities are a test for true believers of Islam, who have been warned about his power and must resist his material temptations. He is thought to appear prior to the Day of Judgment, where he will engage in an epic battle with and be killed by either Jesus (according to Sunni tradition) or the Mahdi (according to the Shia tradition). Al-Dajjal functions symbolically as a key cog in overall Islamic eschatological picture, which emphasises the world coming to an end, of good finally triumphing over evil, and of the remarkable events that will prefigure the replacement of the mortal world with a more authentic form of existence in the afterlife. Various Muslim political movements use the concept of Al-Dajjal to comment on contemporary events, and often identify him with opposing regimes or other worldly forces that they consider as harmful to Islam. They will ravage the earth. Ultimately, Allah will send worms and insects to destroy them. The fifth sign is that Medinah will be deserted, and all that remains in the city will be date palms. The just will have gone to join Mahdi, and the evil to Dajjal. Medinah will have been depopulated for forty years by the time of al-Qiyama. The sixth sign is that a thin ruler with short legs from Ethiopia will attack Mecca and destroy the Kabah. And when the Word is fulfilled against [the unjust], We shall produce from the earth a Beast to [face] them: he will speak to them, for that mankind did not believe with assurance in our Signs. The entire world will be engulfed by dukhan or smoke, for forty days and there will be three huge earthquakes. The Qur'an will be taken to the heavens and even the huffaz will not recall its verses. Finally, a pleasant breeze will blow that shall cause all believers to die, but infidels and sinners will remain alive. A fire will start from Hadramawt in Yemen that shall gather all the people of the world in the land of Mahshar, and al-Qiyamah will commence. In the Qur'an, barzakh (Arabic: برزخ‎) is the intermediate state in which nafs of the deceased are held between realities to rest with loved ones until Qiyamah. The eighth sign is a breeze bearing a pleasant scent will emanate from Yemen, causing the awliya, sulaha and the pious to die peacefully once they inhale it. After the believers die, there will be a period of 120 years during which the world will hold only kafirs, sinners, oppressors, liars and adulterers, and there would be a reversion to idolatry. Abu Hurayrah states that the Messenger of Allah (saw) as said, “The Hour will not be established until the sun rises from the West and when the people see it they will have faith. But that will be (the time) when believing of the soul, that will have not believed before that time, will not benefit it. The Trumpet will (just) be sounded, when all that are in the heavens and on earth will swoon, except such as it will please Allah (to exempt). Then will a second one be sounded, when, behold, they will be standing and looking on! Surely God does not do injustice to the weight of an ant, and if it is a good deed He multiplies it and gives from Himself a great reward. Then shall anyone who has done an atom's weight of good, see it! And anyone who has done an atom's weight of evil, shall see it. This will be followed by perfect, divine and merciful justice. The age of the hereafter, or rest of eternity, is the final stage after the Day of Judgment, when all will receive their judgment from God. The dead will stand in a grand assembly, awaiting a scroll detailing their righteous deeds, sinful acts and ultimate judgment. Muhammad will be the first to be resurrected. If one did good deeds, one would go to Jannah, and if unrighteous would go to Jahannam. Punishments will include adhab, or severe pain, and khizy or shame. There will also be a punishment of the grave (for those who disbelieved) between death and the resurrection. Ibn al-Nafis wrote of Islamic eschatology in Theologus Autodidactus (circa AD 1270), where he used reason, science, and early Islamic philosophy to explain how he believed al-Qiyamah would unfold, told in the form of a theological fiction novel. Imran Nazar Hosein wrote numerous books that deal with Islamic eschatology (Ilmu Ākhir al-Zamān - Knowledge of the later days), among which the most famous is Jerusalem in the Qur'an. According to End Times Research Center, "The beginning of the End of Time, including the emergence of the Imam Mahdi (Mehdi), will most likely be either in 2015 (or 2016), while Jesus Christ (p)'s return [or second (2nd ) coming] is in 2022, in-sha-Allah (if God is willing)." ^ "Islamic Eschatology". Retrieved 29 August 2015. ^ "Major Signs before the Day of Judgment". Shaykh Ahmad Ali. ^ Hasson, Isaac. Last Judgment. ^ a b c Gardet, L. Qiyama. ^ a b Yahya, Harun (12 May 2010). Portents And Features Of The Mahdi’s Coming. Global Publishing. Kindle Edition. ^ a b c d e Richardson, Joel (7 April 2006). Antichrist: Islam's Awaited Messiah. Pleasant Word-A Division of WinePress Publishing. p. 284. ^ "Six Articles of Faith in Islam". Retrieved 29 August 2015. ^ Ben David, Mikhah (20 Feb 2011). What does it mean that "the Mahdi will rule according to the Judgment of David and Solomon"?. New Dawn Publications. ^ a b c d Hooper, Rev. Richard (20 April 2011). End of Days: Predictions of the End From Ancient Sources. Sedona, AZ. p. 156. ^ a b c d e f g h Yahya, Harun (1 January 2008). Clarity Amidst Confusion: Imam Mahdi and the End of Time. Global Publishing. Kindle Edition. p. 64. ^ a b Jon R. Stone. Expecting Armageddon: Essential Readings in Failed Prophecy. ^ Christine Huda Dodge. The Everything Understanding Islam Book: A complete guide to Muslim beliefs, practices, and culture. p. 182. ^ John L. Esposito. What Everyone Needs To Know About Islam. p. 28. ^ Javed Ahmad Ghamidi. Islam: A Concise Introduction. p. 46. ^ طلوع الشمس من مغربها [Rising of the sun from the west] (in Arabic). ^ Alwi Shihab. Examining Islam in the West. p. 16. ^ Narrated with sound chains from Dhu Mikhbar al-Najashi by Abu Dawud, Ahmad, Ibn Majah, Ibn Hibban, and al-Hakim who declared it sahih and al-Dhahabi concurred. See Shaykh Shu`ayb Arna'ut's documentation of this hadith in his edition of Sahih Ibn Hibban (15:101-103 #6708-6709). ^ Begley, Wayne E. The Garden of the Taj Mahal: A Case Study of Mughal Architectural Planning and Symbolism, in: Wescoat, James L.; Wolschke-Bulmahn, Joachim (1996). Mughal Gardens: Sources, Places, Representations, and Prospects Dumbarton Oaks, Washington D.C., ISBN 0884022358. pp. 229-231. ^ a b c d Waldman, Marilyn Robinson. "Eschatology: Islamic Eschatology". Encyclopedia of Religion. Detroit: Macmillan Reference (subscription required). ^ a b Arjomand, Said Amir (Dec 2007). "Islam in Iran vi., the Concept of Mahdi in Sunni Islam". Encyclopaedia Iranica XIV (Fasc. 2): 134–136. ^ Peterson, Daniel C. "Eschatology". Oxford Islamic Studies. The Oxford Encyclopedia of Islamic Studies (subscription required). ^ Rogers, Ed (26 Oct 2011). Islam and the Last days. Connection Publishing. ^ Poston, Larry (January 2010). "The Second Coming of ‘Isa: an Exploration of Islamic Premillennialism". The Muslim World 100: 108–109. ^ Oxford Islamic Studies Online. "Eschatology". Oxford University Press (subscription required). ^ Leaman, Oliver. "Dajjāl, Al-". The Oxford Encyclopedia of the Islamic World. Oxford University Press (subscription required). ^ Khan, Muhammad Muhsin (trans.). The Holy Qur'an. B007D64VX6. Retrieved 13 September 2015. ^ "Saudi Arabia Ministry of religious affairs". ^ a b "Tafseer Ibn Katheer (23-100)". ^ "Tafseer Ibn Katheer (25:53)". ^ "Tafseer Ibn Katheer (25:53)(55:19)". ^ Muhammad, S. Umar (1999). Muslims' Eschatological Discourses on Colonialism in Northern Nigeria (PDF). Oxford University Press. pp. 59–84. ^ Jerusalem in the Qur'an by Imran N. Hosein. "Fath al-bârî fî sharh sahîh al-bukhârî" (from Sahih al-Bukhari by Ibn Hajr al-Asqalani). Esposito, John, The Oxford Dictionary of Islam, Oxford University Press, 2003, ISBN 0-19-512558-4. Richard C. Martin, Said Amir Arjomand, Marcia Hermansen, Abdulkader Tayob, Rochelle Davis, John Obert Voll, Encyclopedia of Islam and the Muslim World, MacMillan Reference Books, 2003, ISBN 978-0028656038. Islamic Eschatology group on Facebook.